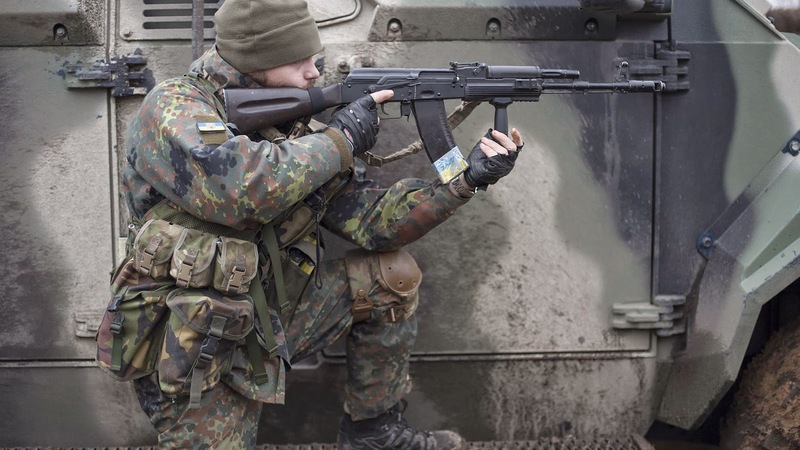 KIEV, Ukraine -- Just like the conflicts in Iraq and Syria, the violence in eastern Ukraine is attracting foreign fighters – some with the pro-Russian separatists, and some with the Ukrainian government forces. Many of these fighters are from European countries. This makes it curious that we don’t hear much about this phenomenon from European governments – which are, of course, clamping down on citizens who go to fight in the Middle East. True, the numbers of foreigners fighting in Ukraine’s Donbass region appear to be relatively low – perhaps 300 on each side. That compares with at least 20,000 foreigners fighting in Iraq and Syria. However, as in those conflicts, many armed foreigners in Ukraine are motivated by radical ideologies as much as, or more than, mere money. “They, as a group or as lone individuals, might constitute a threat to European security and must be closely monitored,” says Kacper Rekawek, a Polish expert on the Ukrainian conflict. Rekawek has written a lucid, well-researched paper on foreign fighters in Ukraine. Published by the Warsaw-based Polish Institute of International Affairs, the paper makes the important point that there is no truth to the Russian allegations that a “NATO foreign legion” is fighting for the Kiev government, and no truth to the fantasy that the separatists have been joined by some sort of “Donbass international brigades”. Nonetheless, there are enough foreign fighters in Ukraine for the issue to deserve the attention of European governments. Rekawek’s study estimates that the bulk of the foreigners fighting for the pro-Russian separatists come from Germany (up to 100), Serbia (up to 100), Hungary (up to 30) and the US (up to 25). On the Ukrainian side, the largest contingents come from Belarus (up to 100), Georgia (up to 100) and Croatia (32 or more), Rekawek says. What motivates foreigners to fight with the Donbass rebels? For Serbs and people of Serbian origin in other countries, the pro-Russian separatists seem like Orthodox Christian brothers with whom they share a common hatred of the EU and US. Meanwhile, some western European fighters, having fallen for Russia’s propaganda that the Kiev government is stuffed full of far-right fanatics, think they are engaged in an anti-fascist crusade. Why do foreigners fight for the Ukrainian government? The large presence of fighters from Belarus and Georgia tells its own story – they are motivated by hatred of what they see as a bullying, imperialistic Russia that might one day crush the independence of their countries. As for the Croat contingent, they see similarities between the way the Donbass separatists are trying to split Ukraine and the way the Serbs of Croatia and Bosnia-Herzegovina tried in the 1990s to break up those two states. Rekawek names one of the main recruiters for the Donbass rebels as Victor Alfonso Lenta, a former member of the French armed forces who encourages would-be fighters to join the rebels as a way of destroying “Anglo-Saxon globalism, atlanticism and the decadent west”. For the Ukrainian government forces, a leading recruiter is Gaston Besson, another Frenchman, who lives in Croatia, Rekawek says. Moreover, the Ukrainian diaspora in Canada, Portugal and elsewhere provides aid and materiel for the Ukrainian side, and some of them have gone to fight in eastern Ukraine. It is a timely warning.